Dinosaur hoodie to remind you Halloween approaches!! [Tom’s] dinosaur hoodie would make a bang up Halloween costume. It’s a glowing version of the bony plates you’d find on a Stegosaurus. Not only does it look great at night, you should be able to put one together or yourself in an afternoon. He used a laser cutter to make the translucent fins, but it would not be hard to cut them all out by hand. Each piece is two sides of the plate connected by a narrow rectangle which leaves room inside for an RGB module. These are chained together and controlled by an Arduino (most likely using SPI or I2C, we’re not sure which), then sewn on the back of a hoodie. Update: [Matt] made a derivative of this design. The plates are pointy like a stegosaurus. Which reminds us… Halloween quickly approaches and we haven’t seen the usual onslaught of awesome. We love this time of year because of the ingenuity that comes out to play in the costumes, yard decor, and scare tactics being prepared for the big night. Please send a link to your project and we’ll start pumping out the holiday features. To get you thinking, here’s a set of folding wings used in a costume, and a possessed powerwheels to chase down the little ones. Don’t sit on your hands, we want to hear about every project! 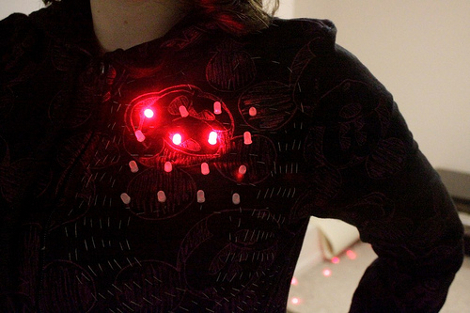 This hoodie senses your heartbeat and uses it to control Life. Conway’s Game of Life, popular in all kinds of electronics projects, uses a grid of cells coupled with a set of rules to mimic the life and death of simple organisms. This iteration displays the game over your own heart, then taps into your heart rate, resetting the game at the beginning of each cardiac cycle. We guess you could say that Life goes on only if you do not. The EKG circuit that detects the heartbeat is made up of an IR transmitter shining through the tip of your finger to a receiver. An ATmega168 running the Arduino bootloader controls the EKG circuit and resets an ATmega48 which is responsible for Life. [Joe] admits that this is overkill but he’s currently without an AVR programmer; he went this route to make it work. The stylishly-geeky hoodie is taken for a test run (er… test-hop?) after the break. Though much of [citizenFinerran]’s intent in designing a suit that camouflages the wearer from security camera footage was philosophical, it is designed with a very tangible purpose in mind. 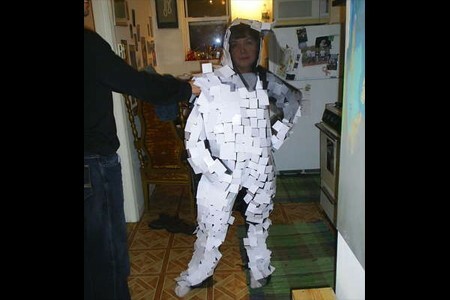 The suit does not provide true camouflage (to say nothing of true invisibility), but it does create enough moving visual obstructions to make the wearer completely anonymous on film. More details on this and other invisibility cloaks after the break. Prof. Fartsparkle wrote a reply on DLT one - A Damn Linux Tablet!. Prof. Fartsparkle has updated the project titled DLT one - A Damn Linux Tablet!. Ahmed Azouz has added details to UR12 Musician & Assistant Robotic Arm. István Nótai liked DMX Controller Mk2. Yann Guidon / YGDES liked Vacuum tube single digit calculator. Ahmed Azouz has added a new project titled UR12 Musician & Assistant Robotic Arm. glasswoodaudio liked The Muffsy BSTRD - Class A Valve Preamp.